I picked up an Amrel PPS-2322 programmable power supply from eBay recently. 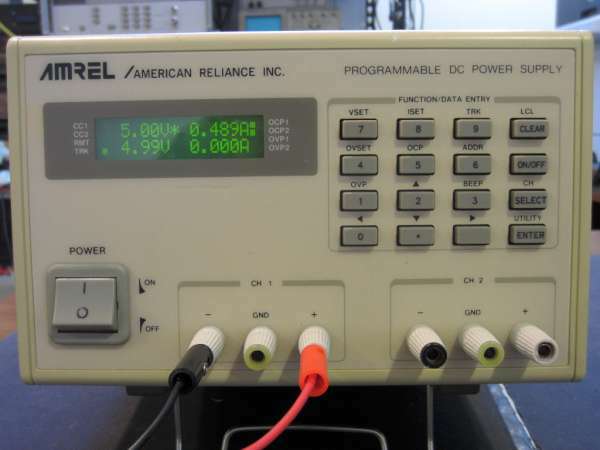 You probably have not heard of the Amrel brand before as American Reliance (Amrel) no longer makes power supplies nowadays. Its power supply division was acquired by AMETEK Programmable Power, a subdivision of AMETEK back in 2010. While Amrel power supplies had been discontinued, Amrel branded electronic loads are still being actively developed and sold by AMETEK. Amrel PPS-2322 is a dual 32V/2A programmable power supply. It has two fully independent channels. They can be used either separately in independent mode or used together in tracking mode. The power supply can be programmed via either the front panel keypad or via GPIB. Power supply outputs can be accessed via the front panel binding posts or the rear panel screw terminals. Note that the sense terminals are only present on the rear. This entry was posted on Friday, May 8th, 2015 at 2:06 pm	and is filed under power supply, Teardowns. You can follow any responses to this entry through the RSS 2.0 feed. You can skip to the end and leave a response. Pinging is currently not allowed.